Is our cat contemplating vegetarianism? I hope not, because cats eat other animals. That's what they do. 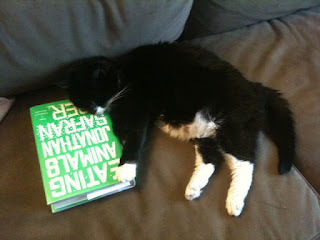 Taffeta has been reading Jonathan Safran Foer's latest book. My cat has a Kindle and an iPad on order. Yeah, but my cat can actually read. Yours is functionally illiterate. So . . . did YOU like it? It wasn't my book. I've read other books on the topic. They are upsetting, but unconvincing. I'm willing to use evolution as my excuse.